The Vatican makes concordats with rightwing governments, both absolute monarchies and fascist dictatorships. However, officially it snubs equally authoritarian governments on the left, since their regimes competed with the Church ideologically, rather than complementing it. But in order to slavage as much influence as possible, the Vatican made quiet working arrangements with communist countries. traditionally allied themselves with the Church through concordats. This was the inside view from a famed canonist at the Gregorian University in Rome who became superior general of the Jesuits and a trusted adviser to Pope Pius X.
Bermúdez (Peru, just two days before he had to step down). The first five gentlemen even made it into the Killers of the 20th Century. These rightwing dictators generally got on well with the Vatican, despite occasional theoretical differences. For instance, regarding the Jews, the Church was anti-Jewish, blaming the Jews for communism, democracy and "killing Christ", while the Nazis were anti-Semitic, blaming them for ancestry that wasn't German. When it came to the crunch, this subtle distinction about exactly what they should be accused of didn't help most Jews very much. In practice, it just meant that a few of the Jews who had converted to Catholicism were saved through Church intervention, while the rest were left to their fate under Hitler. This marriage between fascism and religions has been called clero-fascism or clerical fascism. More about this can be found at the site of the Clero-Fascist Studies Project. Vatican support for rightwing dictators did not end when fascism disappeared from Europe. However, any alliance with the Vatican remains a marriage of convenience, one which is promptly annulled when support for the dictator threatens to become a liability. Thus the standard sequence is for the Vatican to conclude a concordat with a dictator who is anxious for the legitimacy conferred by a concordat with the Holy See. Yet when his hold on power slips and it's clear he's soon going to be to be replaced by popular demand, the Church turns on him. To get more leverage with the future democratic government and be seen as supporting the oppressed, the Church switches sides. It suddenly remembers the dictaor's atrocities and issues grave warnings from pulpits across the land. This happened in their declining days to Spain's Franco, Haiti's Duvalier, the Dominican Republic's Trujillo, Argentina's Juan Peron, Venezuela's Marcos Perez Jimenez and Colombia's Gustavo Rojas Pinilla. Of course, when the Vatican turns on its concordat partners it does not renounce the concordats, as well. 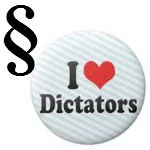 Long after the rightwing dictators have been deposed, these remain. With leftwing dictatorships the relationship is less cosy. The Church opposed Socialism and Communism from very early on, long before the Soviets came to power and began abusing people. This fact suggests that the Church objected to Marxism, not because it was against oppression, but because it wanted to check any competing ideology, especially one which was hostile to religion. The Vatican also compromised, by entering agreements that it didn't call concordats. Whenever it has to find out what was going on and exercise what influence it could, it arranged a modus vivendi — a working agreement — with the various Communist regimes of Eastern Europe. This was a kind of diplomatic note lacking the full force of an international treaty, (which is what a concordat purports to be). The modus vivendi acted to secure whatever could be got, it kept the lines of communication open and yet it withheld the diplomatic recognition conferred by a concordat. The modus vivendi was intended as a stopgap until a leftwing regime collapsed. Then the Vatican could offer a new and more compliant successor the prospect of international recognition and the stabilising support of the Church — at a price — the price of a concordat. And the world's largest communist country can expect to get more concessions than others from the Vatican. At stake the chance to missionise a fifth of the world's population which has been largely beyond ithe Vatican's reach. As of 2018 the diplomatic dance was continuing. Note on the picture of boots: These seem a better symbol of modern Fascism than the traditional "fasces". Springer boots, originally for paratroopers, have thick soles to absorb the shock of landing. Neo-Nazis use them to absorb the shock to their feet of treading on their victims. 5. Muriel Fraser, "Vatican anti-Judaism versus Nazi anti-Semitism: a subtle theological distinction", Concordat Watch, 2006-07-21. In the course of his first visit to Nicaragua in 1983, John Paul II publicly reprimanded the priest Ernesto Cardenal who, together with two other priests, held ministerial posts in the Sandinista government. In 1995, during another visit to Nicaragua, the pope condemned the Iglesia Popular (People’s Church) and what he called the mistaken ecumenism “of Christians engaged in the revolutionary process.” At the same time, he elevated the right-wing archbishop and bitter opponent of the Sandinistas, Miguel Obando y Bravo, to the post of cardinal. At the same time, supporters of right-wing dictatorships ascended to the highest offices of the Church. The papal nuncio to the Argentine military dictatorship, Pio Laghi, and the nuncio to the Chilean military dictatorship, Angelo Sodano, are today both cardinals. Sodano had praised Pinochet’s despotic and murderous rule in Chile with the words: “Masterpieces can also have small errors. I would advise you not to dwell on the errors of the painting, but concentrate on the marvellous general impression.” When an arrest warrant for Pinochet was issued in 1998 while the former dictator was in London, the pope himself publicly supported the Chilean fascist general. 8. "Bishops' Warning", Time, 1960-02-15. 9. David Ranan, Double Cross: The Code of the Catholic Church, (Theo Press, 2000), p. 18.